I must be full of luck this year hehehe. Another Filipino family who live in the base just came back from their holiday vacation in the Philippines and they gave us some pasalubong too. 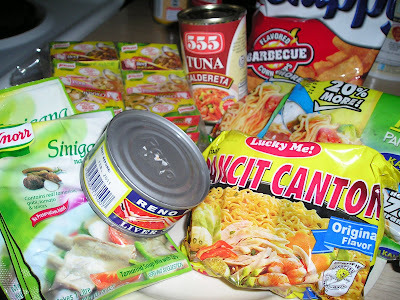 More Pinoy goodies. I miss the pancit canton that I used to cooked every morning in the Philippines and I was so happy that she gave us some. Thanks to the Quizon family! My daughter love taking a bubble bath. She love playing with the bubbles, the funny thing is that she has her barbie dolls with her. Then the fun begins whenever my son would splash in the bath tub too... with his toy cars.... Its just great... but, what can I do but to let them do the things they enjoy. 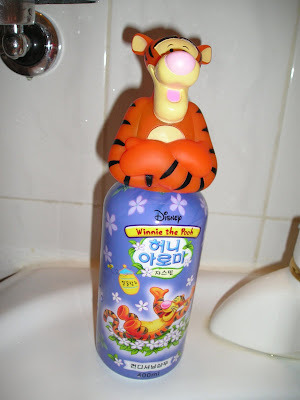 Their laughter cover up the mess anyway hehehe... We bought this Winnie the pooh bubble bath at home plus last week ad its almost empty, boy we need 2 bottle of this every month lol..